Master limited partnerships (MLPs) saw incredible growth last year that's expected to continue in 2015. Even a possible interest rate hike won't derail the sector's strongest offerings from delivering profits. Master limited partnerships are limited partnerships publicly traded on a stock exchange. MLPs by definition must generate revenue about 90% of cash flow from real estate, commodities, and natural resources. The sector has seen booming growth in the past 10 years – especially the last few. According to the Alerian MLP Index, there were 18 MLP IPOs in 2014 that raised over $6.4 billion. 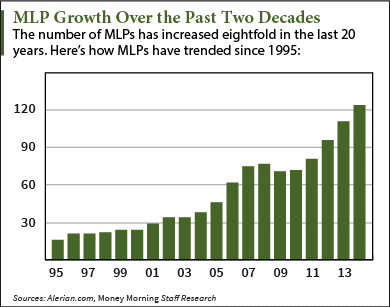 That's a 260% increase in the number of MLP IPOs from 2004. The sector has witnessed a 25% compound annual growth rate over the last 20 years. Since 2004, MLPs have generated 265% in total returns. That's compared to 151% for utilities, 116% for REITs, 109% for the S&P 500, and 58% for bonds. Thanks to a law from the Reagan era, master limited partnerships pay fewer taxes than ordinary companies. In order to receive the tax breaks, these MLPS have to give profits directly to shareholders. But the most significant benefit of MLPs is a particular loophole offering a tax shield for investors. You see, MLPs are different from ordinary stocks because they are "pass-through entities." They transfer the company's earnings to individual unit holders without much influence from market behavior. About 80% to 90% of the distribution investors receive comes from depreciation allowances. These are the cash amounts taken off a company's profit to compensate for any loss the asset may have experienced during a particular time period. In other words, you don't pay taxes on 80% to 90% of your distribution because it's considered a return by the IRS. For example, if you purchase an MLP for $50 and receive a $5 distribution, $4 to $4.50 is tax-deferred. Only the leftover 10% to 20% – or $.50 to $1 – is taxed as regular income. Other than tax benefits, MLPs also offer the most competitive yields on the market. In fact, several of the 50 companies on the Alerian MLP Index offer a 7.5% yield or higher. That beats the Alerian's average yield of 5.7%, and the Dow Jones' 2.75% average. Another reason MLPs are so "marketproof" is their limited exposure to oil and gas prices. Most MLPs own midstream assets, including utilities, pipeline operators, and underground storage. Instead of owning oil and gas, they transport, store, and process them. They are the tollbooth collectors at a bridge, collecting fees as long as the commodities flow. "When you invest in the midstream, you're far less susceptible to price fluctuations in the underlying commodity, and you are able to collect easy profits from the growing demand in fuels," Money Morning Global Energy Strategist Dr. Kent Moors explained. Midstream MLPs are strong picks even when interest rates spike. Their "fee-based" model allows these MLPs to negotiate long-term contracts. They factor year-over-year prices into these contracts in case inflation occurs down the line. That's how they sustain their distribution growth for investors amid high interest rates. The fee-based model also keeps midstream MLPs profitable when oil and gas prices are low – which is why many have been going public recently. Columbia Pipeline Partners LP's (NYSE: CPPL) debut last month raised about $1.1 billion. CPPL was the largest MLP IPO in history. It's down about 2% since its debut, but analysts give it a one-year price target of $33.50 – a 28% premium to where it's trading today. Dominion Midstream Partners LP (NYSE: DM) hit the market in October 2014 and is up 43% since then.